Watford chairman Graham Simpson wants to buy back Vicarage Road if the cash-crippled club win the FA Cup this year. 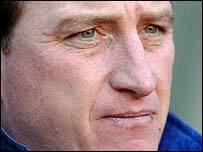 Ray Lewington's side are set for a lucrative semi-final against Southampton at Villa Park next month. The club's lucrative cup run could go some way to restoring the 12% pay cut they took to save Watford from administration. But Simpson also believes going all the way this year would allow the club to buy back the ground they sold for £6m to a mystery buyer in January. He said: "There is a substantial amount of money coming in from our FA Cup run and I hope some of that money will go towards buying back Vicarage Road. Whatever happens from this run we should make sure we put some money aside and go in for buying the ground. "I can't say we can put in x amount at the moment because our priority is to pay back our staff but what we've done so far is speeding up that process." Simpson also revealed he received a personal telephone call from former chairman Sir Elton John after Sunday's 2-0 quarter-final triumph over Burnley. But he revealed the millionaire singer will not be putting his hand in his pocket to help out - and will probably miss the big day on 13 April. Simpson said: "He was listening to the game in Atlanta and he was ecstatic and delighted. "Elton's association has helped us tremendously over the years and he's made the decision that at this time he doesn't want to put any more money in financially. "We accept that and thank him for all he's done."